Using a small plastic swab I painlessly scrabed my cheek to acquire a DNA sample of myself. I mailed the sample to the Genographic Project - a collaboration between National Geographic and others - which carefully analysed my DNA sequence. By comparing specific genetic mutations that has been carried unchanged from father to father through thousands of years I can now literally trace our family back to the "Adam" at the roots of mankinds' scientific history. My Y-chromosome results identify me as a member of haplogroup R1b. The genetic markers that define my ancestral history reach back roughly 60,000 years to the first common marker of all non-African men, M168, and follow my lineage to present day, ending with M343, the defining marker of haplogroup R1b. The man who gave rise to the first genetic marker in my lineage probably lived in northeast Africa in the region of the Rift Valley, perhaps in present-day Ethiopia, Kenya, or Tanzania, some 31,000 to 79,000 years ago. Scientists put the most likely date for when he lived at around 50,000 years ago. His descendants became the only lineage to survive outside of Africa, making him the common ancestor of every non-African man living today. But why would man have first ventured out of the familiar African hunting grounds and into unexplored lands? It is likely that a fluctuation in climate may have provided the impetus for my ancestors' exodus out of Africa. The African ice age was characterized by drought rather than by cold. It was around 50,000 years ago that the ice sheets of northern Europe began to melt, introducing a period of warmer temperatures and moister climate in Africa. Parts of the inhospitable Sahara briefly became habitable. As the drought-ridden desert changed to a savanna, the animals hunted by my ancestors expanded their range and began moving through the newly emerging green corridor of grasslands. My nomadic ancestors followed the good weather and the animals they hunted, although the exact route they followed remains to be determined. The next male ancestor in my ancestral lineage is the man who gave rise to M89, a marker found in 90 to 95 percent of all non-Africans. This man was born around 45,000 years ago in northern Africa or the Middle East. The first people to leave Africa likely followed a coastal route that eventually ended in Australia. My ancestors followed the expanding grasslands and plentiful game to the Middle East and beyond, and were part of the second great wave of migration out of Africa. Beginning about 40,000 years ago, the climate shifted once again and became colder and more arid. Drought hit Africa and the grasslands reverted to desert, and for the next 20,000 years, the Saharan Gateway was effectively closed. With the desert impassable, my ancestors had two options: remain in the Middle East, or move on. Retreat back to the home continent was not an option. These semi-arid grass-covered plains formed an ancient "superhighway" stretching from eastern France to Korea. My ancestors, having migrated north out of Africa into the Middle East, then traveled both east and west along this Central Asian superhighway. A smaller group continued moving north from the Middle East to Anatolia and the Balkans, trading familiar grasslands for forests and high country. My next ancestor, a man born around 40,000 years ago in Iran or southern Central Asia, gave rise to a genetic marker known as M9, which marked a new lineage diverging from the M89 Middle Eastern Clan. His descendants, of which I am one, spent the next 30,000 years populating much of the planet. The next marker of my genetic heritage, M45, arose around 35,000 years ago, in a man born in Central Asia. He was part of the M9 Eurasian Clan that had moved to the north of the mountainous Hindu Kush and onto the game-rich steppes of present-day Kazakhstan, Uzbekistan, and southern Siberia. Although big game was plentiful, the environment on the Eurasian steppes became increasing hostile as the glaciers of the Ice Age began to expand once again. The reduction in rainfall may have induced desertlike conditions on the southern steppes, forcing my ancestors to follow the herds of game north. My ancestors' resourcefulness and ability to adapt was critical to survival during the last ice age in Siberia, a region where no other hominid species is known to have lived. After spending considerable time in Central Asia, refining skills to survive in harsh new conditions and exploit new resources, a group from the Central Asian Clan began to head west towards the European sub-continent. My lineage falls within the first haplogroup, R1, and gave rise to the first modern humans to move into Europe and eventually colonize the continent. 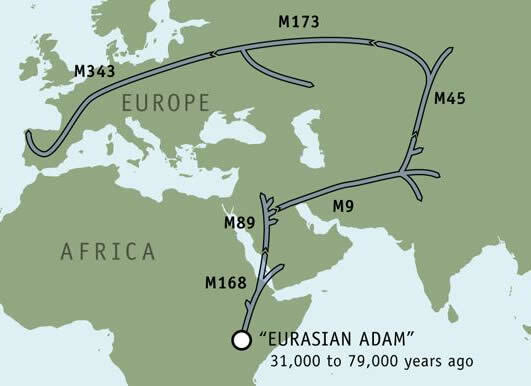 As my ancestors continued to move west, a man born around 30,000 years ago in Central Asia gave rise to a lineage defined by the genetic marker M173. His descendants were part of the first large wave of humans to reach Europe. My ancestors' arrival in Europe heralded the end of the era of the Neandertals, a hominid species that inhabited Europe and parts of western Asia from about 29,000 to 230,000 years ago. Better communication skills, weapons, and resourcefulness probably enabled my ancestors to outcompete Neandertals for scarce resources. Around 20,000 years ago, the climate window shut again, and expanding ice sheets forced my ancestors to move south to Spain, Italy, and the Balkans. As the ice retreated and temperatures became warmer, beginning about 12,000 years ago, many descendants of M173 moved north again to recolonize places that had become inhospitable during the Ice Age. Around 30,000 years ago, a descendant of the clan making its way into Europe gave rise to marker M343, the defining marker of my haplogroup. You are a direct descendent of the people who dominated the human expansion into Europe, the Cro-Magnon. The Cro-Magnon are responsible for the famous cave paintings found in southern France. These spectacular paintings provide archaeological evidence that there was a sudden blossoming of artistic skills as my ancestors moved into Europe. Prior to this, artistic endeavors were mostly comprised of jewelry made of shell, bone, and ivory; primitive musical instruments; and stone carvings. My ancestors knew how to make woven clothing using the natural fibers of plants, and had relatively advanced tools of stone, bone, and ivory. Their jewelry, carvings, and intricate, colorful cave paintings bear witness to the Cro-Magnons' advanced culture during the last glacial age. This is where my genetic trail, as we know it today, ends. What's a haplogroup, and why do geneticists concentrate on the Y-chromosome in their search for markers? For that matter, what's a marker? Each of us carries DNA that is a combination of genes passed from both our mother and father, giving us traits that range from eye color and height to athleticism and disease susceptibility. One exception is the Y-chromosome, which is passed directly from father to son, unchanged, from generation to generation. In some instances there may be more than one mutational event that defines a particular branch on the tree. What this means is that any of these markers can be used to determine my particular haplogroup, since every individual who has one of these markers also has the others. A haplogroup is defined by a series of markers that are shared by other men who carry the same random mutations. The markers trace the path my ancestors took as they moved out of Africa. It's difficult to know how many men worldwide belong to any particular haplogroup, or even how many haplogroups there are, because scientists simply don't have enough data yet. One of the goals of the five-year Genographic Project is to build a large enough database of anthropological genetic data to answer some of these questions. To achieve this, project team members are traveling to all corners of the world to collect more than 100,000 DNA samples from indigenous populations. In addition, the Genographic Project encourage everyone to contribute results to the project database, helping geneticists reveal more of the answers to our ancient past. My DNA was analyzed for Short Tandem Repeats (STRs), which are repeating segments of the genome that have a high mutation rate. The location on the Y chromosome of each of these markers is depicted in the image below, with the number of repeats for each of my STRs presented to the right of the marker. For example, DYS19 is a repeat of TAGA, so if my DNA repeated that sequence 12 times at that location, it would appear: DYS19 12. Studying the combination of these STR lengths in my Y Chromosome allows researchers to place me in a haplogroup, which reveals the complex migratory journeys of my ancestors. As additional genetic data are collected and analyzed, more will be learned about my place in the history of the men and women who first populated the Earth. The Genographic Project will be updating these stories throughout the life of the project. A constant source of inspiration for me - telling stories about all people in the world and beyond.